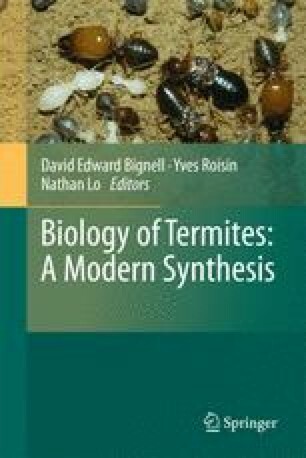 Termites are key decomposer insects in numerous ecosystems in the tropics and beyond, and their unique social systems provide a major counterpoint to those of hymenopteran social insects. Our knowledge of the phylogenetics and systematics of the group have traditionally lagged behind those of other important insect groups, but significant progress has now been made. Here we review recent phylogenetic studies of relationships both among termites, and between termites, cockroaches and mantids. We also discuss studies of co-cladogenesis between termites and two groups of symbionts: cellulolytic hindgut flagellates, and Blattabacterium. A consensus has emerged that the sister-group of termites is the wood-feeding cockroach genus Cryptocercus, and that the digestion of wood by the common ancestor of these two groups was aided by cellulolytic hindgut flagellates. The basal phylogenetic position of Mastotermes darwiniensis among termites has been confirmed, however agreement on the phylogenetic positions of members of the Kalotermitidae, Termopsidae and Hodotermitidae has yet to be reached. Relationships between and within the Rhinotermitidae and Serritermitidae also remain to be settled. Key lineages of the major family Termitidae, however, are now fairly well established.